tspec - all you never wanted to know. Tspec was designed for use with Tserv, Tetrix and JTS. It won't work with the standard client/server. 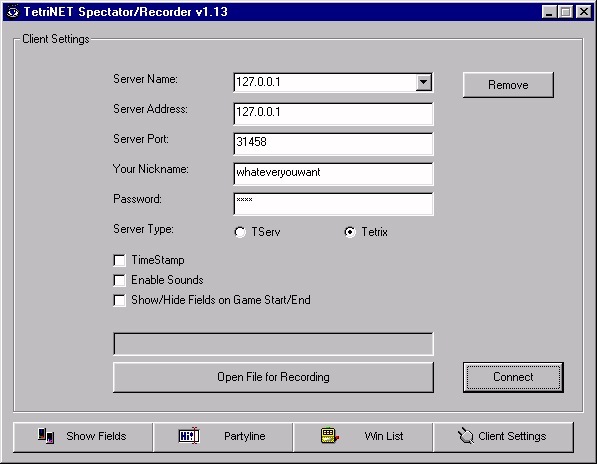 I'll use TspecX in this demo, but the same principle applies to Tspec if you're playing on a TetriNET server. Select the partyline and change channels as you normally would in tetrinet (/join #pure, etc). and put it in the directory where you put TspecX/Tplayer (so that you don't have to enter the directory path, just the filename. of course, it's entirely up to you how you organise your files). Press play, or fast forward if you want to skip forth. The recording will play in Tspec/X. If you get a "type mismatch" error your rec file is probably invalid or corrupt. Connect to a server that supports Tspec/X. This begins the recording; to end it, uncheck the Recording box. Close the file in the client settings screen. 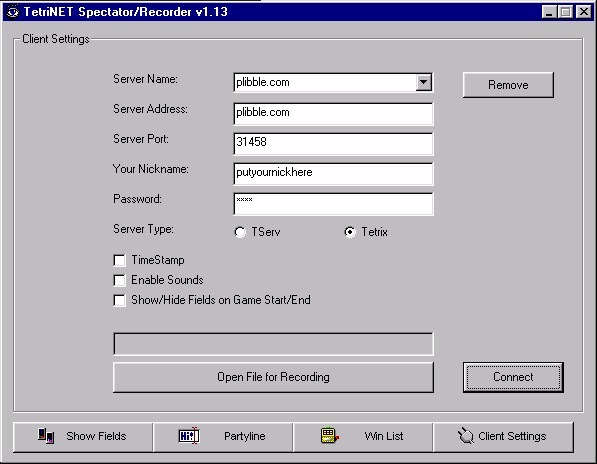 There are some old tnet recordings here (don't forget to use Tspec, not TspecX). If you have any recordings you want to display, drop me an email at sidewise@go.com and I'lll host them here. Tspec/TspecX/Tplay by the mighty starfish man, ekn.